« Duty officers how many of each type do I need? The starfleet academy cadet event occurs in the SOL system of the Sirius block. It occurs twice each day, the first time is 9:00 am EST and the second time is 1:00 pm EST. The event is normally pretty crowded, after all it is free dilithium ore. The best way to start is to switch to an instance with only a few people in it. 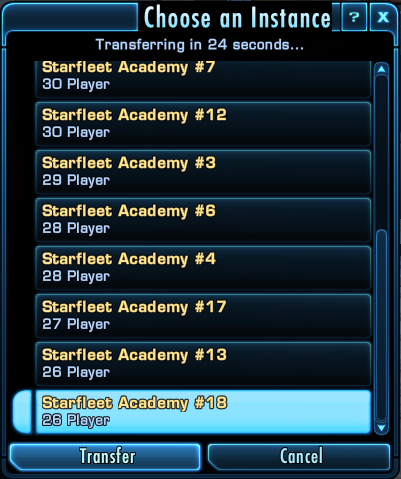 To do this you need to click on the words STARFLEET ACADEMY at the top of your mini map. This will bring up a menu called Choose an Instance. Scroll down to the bottom of that menu and find the instance with the least amount of players, then click transfer. To obtain your science cadet you need to first locate the terminal that dispenses them. The terminal is located in front of Professor Meyer. You can open your mini map and locate the terminal by the circle as illustrated on the image. The terminal has one of the stylized I icons above it and when you get close it shows a menu to request a cadet. Just click on this menu item and your new cadet will beam in beside you. How do I find particle fragments? This is normally the first thing people ask in local chat during the event. 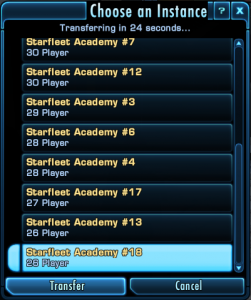 Most people just blur past the text trying to get to the free dilithium. That text is important in this case because it reveals how to find the fragments. To find the fragments you have to scan and analyze the glowing blue spheres. They are kind of faint but they can be found on walkways, and inside the various buildings at the academy. I found a blue sphere, how do I collect it? Actually, there are 3 seperate outcomes from pushing that scan button. The worst outcome is to push it and have it tell you that the particle collapsed and to keep searching. The best outcome is for the particle to become isolated. Once the particle is isolated you can collected it depending on what the particle is doing. If the particle is expanding you need to use a multiphasic scan. if the particle is disipating you need to use the positron scan. If you choose the wrong one it will destroy the particle so take a second and get it right. 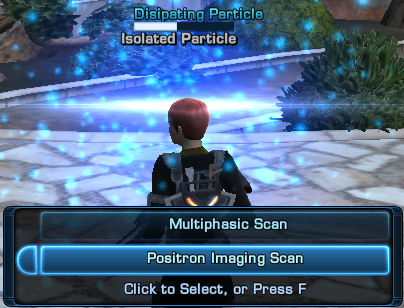 If you successfully use the right scan on the particle you will receive 2 of the particle fragments. Why are klingons at Starfleet Academy? 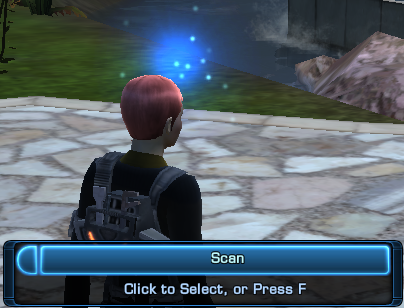 The third option from scanning a particle is that a klingon hologram will beam in beside you and attack. There is alot of speculation as to why this occurs, but the science cadet seems to have a plausible answer. It keeps us on our toes. That’s right the professor believes that science cadets need training in combat as well and it’s your job to assist them. 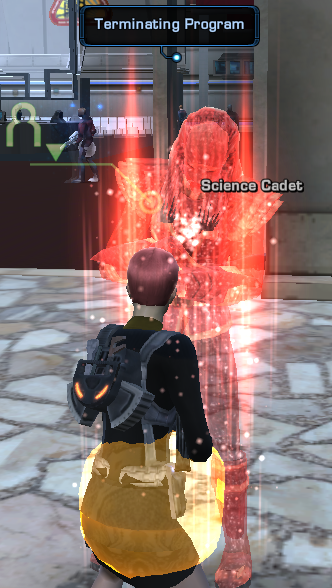 This hologram will follow you around, shoot at you, shoot at your cadet, attack other people, etc. Basically it’s your typical klingon. Nothing but blood and guts and revenge on it’s mind. The best advice here is to just continue attacking the hologram until it terminates it’s program. When it does it will drop a single particle fragment for you. But be careful, some people just run away from their own klingons and leave them running around causing havoc. They seem to like to flank you and can kill you quite quickly if you aren’t paying attention to your surroundings. There are many different ways that people attempt to maximize the amount of particles they can collect, running around, staying still, cutting in front of other players, etc. The best way that I have found is actually pretty simple. Find an area that is relatively quiet with 3 or 4 particles around you. Then just run back and forth between them. You will have very little time sitting still and there should always be a particle forming as you are finishing with the one you are on. I have collected over 120 particle fragments an hour using this method. As more fragments equals more free dilithium, I tend to try to maximize the particles I can collect. But by all means experiment and if you find a better way drop me a comment. Now that you have your particles and the hour is over, it’s time to turn them in for dilithium. You need to go to Professor Neil Meyer to turn them in, alternately if you haven’t lost your cadet you can speak to them as well. Normally, after an hour of running around the cadet is gone, typically killed by a klingon hologram. Either way you will be offered 3 choices for your fragments. As with just about everything in life, more is definately better. In this case you get approximately 10% more by buying the next larger box. So, earn yourself some more dilithium by choosing the larger boxes first. 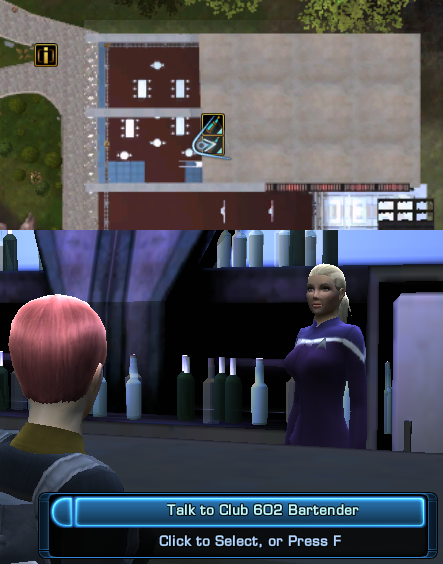 You will almost always have a few extra particles, turn those particles into credits before you leave by selling them to the Club 602 bartender for 50 credits a piece. 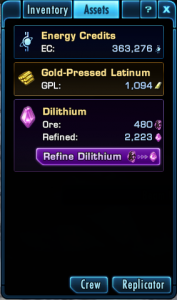 Raw dilithium ore is pretty much useless, but you can refine 8000 units of it per day into refined dilithium which you can use to buy things like duty officers, ships, and cryptic points. Its relatively simple to do this. First you need to open your inventory. 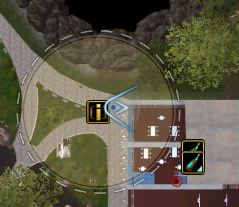 You can access it by hitting the letter I on your keyboard or by using the box icon on the right side of your mini map. Once you have your inventory open on the top of it is the word Assets if you click that you will come to a menu that has the option to refine the ore. Click the purple button and you are done. While it will probably not get you all the way to the dilithium cap by itself, it is quite easy to earn 2304 dilithium in an hour doing using the above method. At current rates thats about 10 Cryptic points in an hour. In future posts I will touch on how to ensure that you reach the cap with the minimal amount of time.